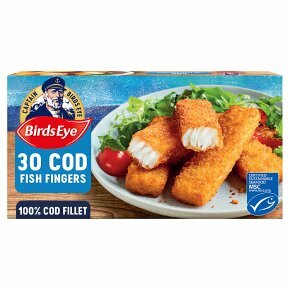 Cod fillet Fish Finger, lightly fried. Please ensure food is cooked until piping hot.These instructions are guidelines only.Do Not refreeze after defrosting. Medium grill 12-15 minsPre-heat the grill.Turn over occasionally.Cook until crisp and golden. Tastiest when Oven Baked Straight from the Freezer.230°C, Fan 210°C, Gas Mark 8 12-15 minsPre-heat the oven.Place on a baking tray in the top part of the oven.Turn over halfway through cooking.Cook until crisp and golden.